Hugh Cook’s work blends fantasy with science fiction. Mr. Cook died of brain cancer in August 2008. You can read about his battle at his blog. 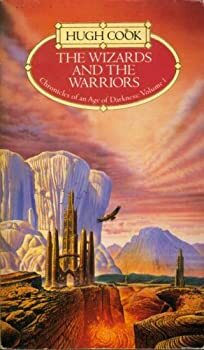 The Chronicles of an Age of Darkness (The WizardWar Chronicles) — (1986-1992) Publisher: The Confederation of Wizards is forced to put aside its long-standing historical dispute with the inhabitants of Rovac. Instead, both must join together in a common cause, to prevent the utter destruction of their world. They face two perils: the Swarms, and a power that turns living things to stone and brings rocks to life. The Wizards and the Warriors was also released as The Wizard War. The Wordsmiths and the Warguild was published as The Questing Hero and The Heroes Return (2 volumes). The Women and the Warlords was also published as The Oracle. The first half of The Walrus and the Warwolf was published as Lords of the Swords. With a title like The Wizards and the Warriors, I would normally have steered clear of this book for the foreseeable future. I don’t think I’m overly snobbish, but it just brings to mind so many B-movies of the fantasy genre from the late 70’s and early 80’s starring has-beens or never-will-bes that I wouldn’t have expected much of it, and would certainly not have desired to plow through 500+ pages of what I would have at most expected to be mildly entertaining, and perhaps moderately wince-inducing, fluff. Other reviewers I trust, however, conspired against me and assured me that there was much more to The Wizards and the Warriors than that. Turns out they were right.